Claudia Torres is at home in the woods of Western New York where she walks daily in the park with her dogs. In a former life, she was the creator and host of the public access television show Truckstop Intellectuals, which showcased local artists and writers. This is her second Architrave poem. A straight shooting poem needs a sturdy typeface that nonetheless has a bit of style. Futura is somehow mostly straight but slightly rounded, evenly weighted but overall a light presence on the page. How else to convey the poem’s struggle? Century provides just enough curl to give the title and poet’s name the attention they deserve. 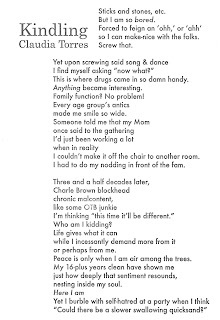 Read the full text of the poem by clicking the image, or purchase it here. Gamble’s speaker knows saints and superheroes exist not just in the mundane world but because of it. The idea that a person’s wounds can make them great isn’t new; what’s fresh here is the speaker’s appropriation of her Heros’ wounds instead of their fame. It’s easy to get angry when you’ve been kidnapped to the underworld or “roped... under an overpass,” it might make you want to escape, “fly [your] plane at night when no one can see” or “hide beneath the flowers.” But a girl can’t stay hidden forever and the nasty, violent world persists. The poet gives us a compelling alternative: own it all, stake a fierce claim and announce it to the world with your best barbaric yawp. A manifesto, by definition, is deeply personal and seethes with energy. This one reads like something scrawled in haste, in the heat of its moment across whatever surface was available. Writing Stuff is a handwriting typeface that is nonetheless delicate, like the speaker, who, chronically misunderstood, has been pushed to the edge. Likewise, the small caps of Optimus Princeps, its slightly larger caps and pronounced serifs read like a shout: Here I Am! All Of Me! Look! Kejt Walsh emerged, dew-eyed, from Iowa’s capitol city and has been splitting time between East and West Coast haunts ever since. Kejt likes drinking chai with non-dairy milk, petting large dogs, and walking in the rain. 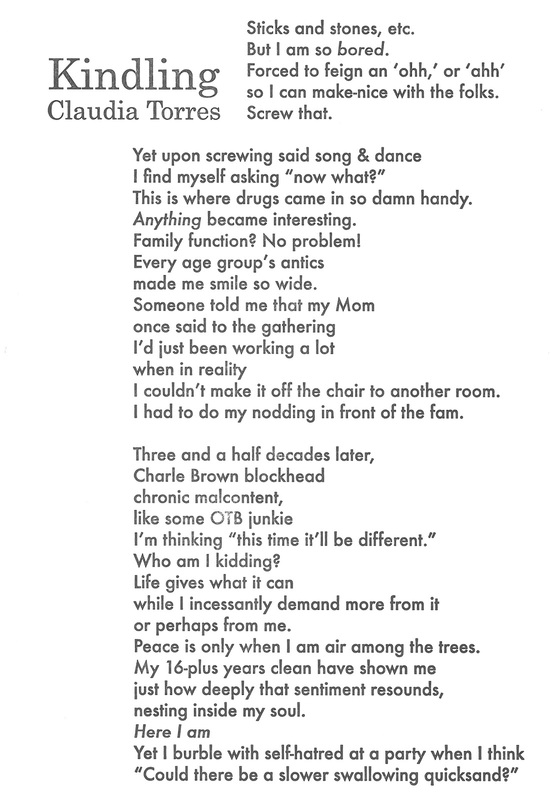 Kejt’s poetry has been featured in GOUIEand Bluestem, and an essay entitled “Why I Write” appeared in Broad! a gentlelady’s magazine. Kejt is currently completing a philosophy degree in Eugene, OR, and looks forward to a life characterized by the constant presence of books. Have you ever wanted to escape so badly that you wished you could transform yourself, become unrecognizable? It’s a story that reaches back to Apollo and Daphne, but Kejt Walsh gives it an uneasy, modern twist. Her speaker identifies with all the would-be Daphnes who “each turn tree,” calling one “sweet sister.” Her descriptions of these “tree-girls” betray her own longing to transform, to “reach/ for other leaves, birds’ nests.” But she can’t quite forget that trees get cut down for all kinds of arbitrary reasons. It’s this knowledge that undercuts the last line; in such a world, no one is “saved” and the speaker knows her “feeble assurances” to the contrary aren’t enough. Safety is, at best, temporary, no matter how much the speaker longs for it, no matter how hard she tries to reassure herself of the contrary. Trees as women, women as trees - it was probably an old association even in antiquity, so it’s no coincidence that we call tree branches “limbs.” The typeface therefore needed to have a similar reaching quality without becoming illegible. Echelon’s diagonals arc off the vertical stems (see the capital N) and in letters like the lower case w, create a swaying effect. Euphorigenic is similarly organic, the way the capitals and the lower case t descend, how its heavy serifs root it to the baseline, the tendrils of the capital S and lower case j. 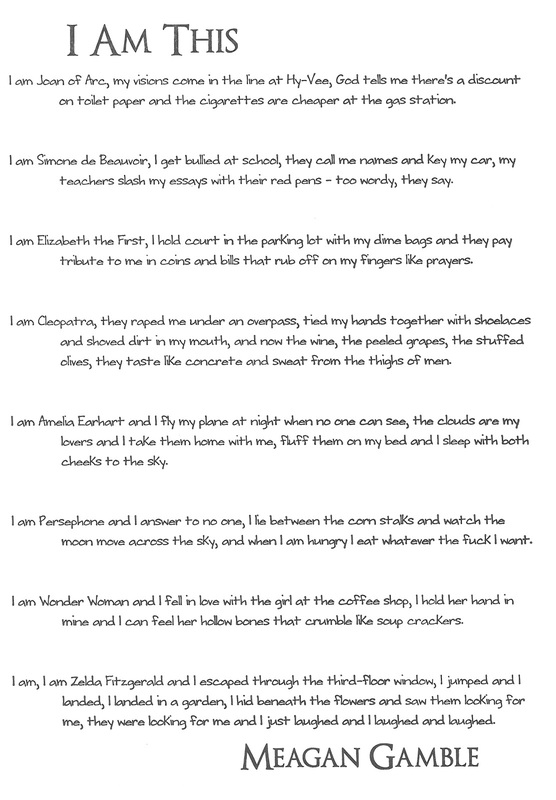 Read the full text of the poem by clicking on the image, or purchase it here. 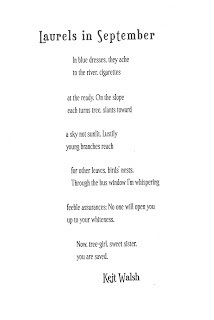 Michael Hettich has published a dozen chapbooks and books over the years, most recently The Animals Beyond Us (New Rivers Press, 2011) and Like HappinessThe Measured Breathing, won the 2011 Swan Scythe Press Chapbook contest. His poems have appeared widely in journals and anthologies. He lives in Miami and teaches at Miami Dade College. His website is michaelhettich.com. the lower case f and l refuse to combine into a ligature (as they do in, for example, Futura). 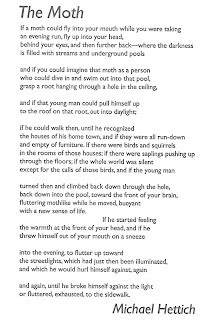 When you tell a friend a fanciful story, their eyes might widen, their mouths might open into a silent O – and so this poem has substituted Os in key words, as if it cannot quite believe its own story. 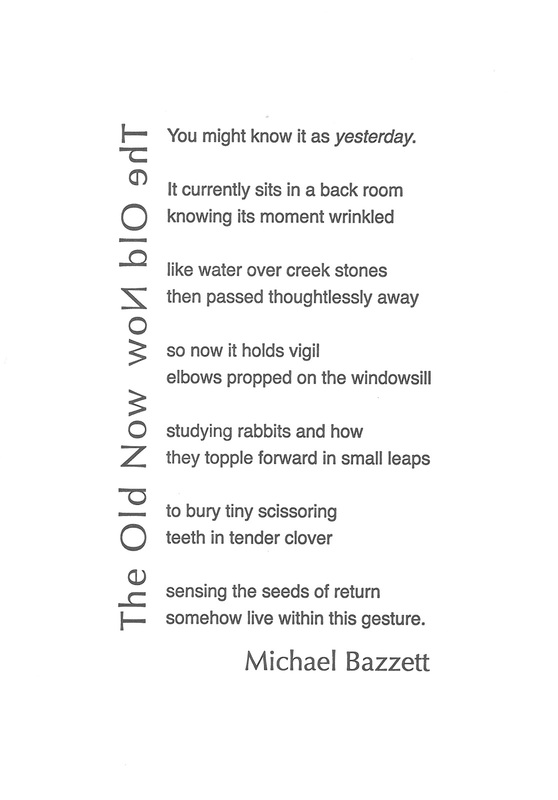 Michael Bazzett's poems have appeared in West Branch, Beloit Poetry Journal, Best New Poets, Green Mountains Review, DIAGRAM, and Guernica, among others, and his work was recently nominated for a Pushcart Prize. 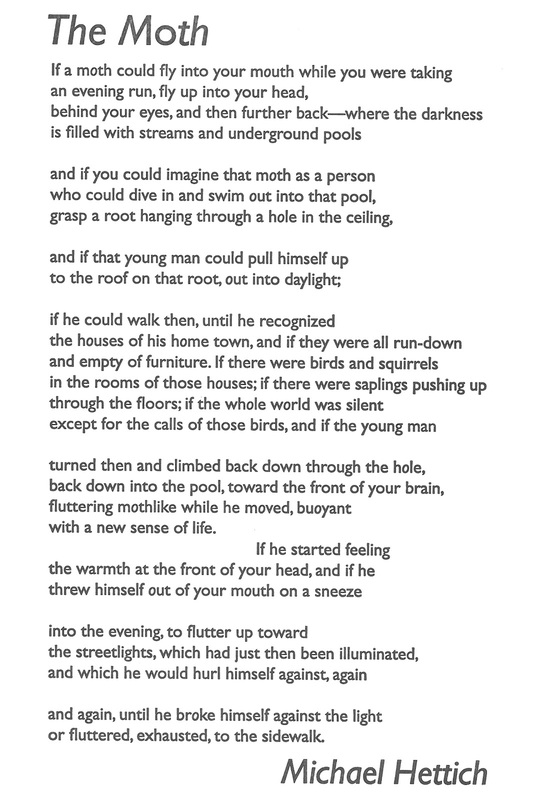 He was the winner of the 2008 Bechtel Prize from Teachers & Writers Collaborative, and new poems are forthcoming in Carolina Quarterly, Pleiades, Smartish Pace and The Literary Review. He lives in Minneapolis with his wife and two children. Imagine all the moments of your past (both those you’d love to relive and those you’d rather forget) intent on happening again. They haven’t really “passed thoughtlessly away” at all. They’re just “in a back room… hold[ing] vigil/ elbows propped on the windowsill” looking for a way into the present moment. They might take the form of a memory or a dream, or maybe just a vague feeling that the same things happen over and over. 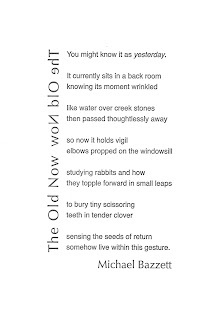 Bazzett’s speaker is haunted by it all, but gently so: the poem’s closing image of rabbits munching clover is all springtime possibility, and isn’t that why we hold our memories so close? It’s hard to know which has the stronger pull, the possibility of renewed happiness or the chance to set a wrong to right. 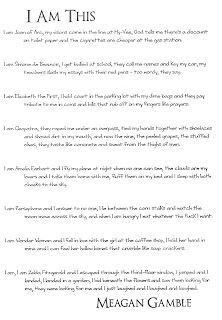 For a poem that addresses the transition between moments, the typefaces needed to be similar enough to suggest a continuum but at the same time distinctly different. Helvetica is a classic modern sans serif – ubiquitous in public signage, helping people get from here to there – but somehow timeless. Optima is ever so slightly serifed, more distinctive but less famous, a first cousin. Using digital design to create printers plates allowed me to reverse the type of the title for a true mirror effect – something that's impossible with lead type. 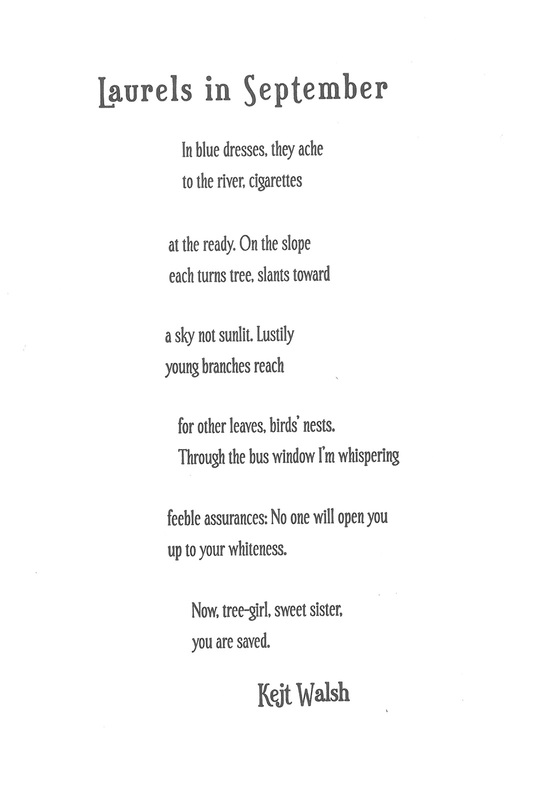 It seemed appropriate for a poem that loops back on itself "sensing [its own] seeds of return." Our world is faster and louder than ever. The result is a fragmented, cacophonous experience that can feel meaningless. But gambell-peterson insists it's possible to make sense of things, if only we're willing to "sit silent" long enough to "let the wild grow accustomed." There is, of course, the need for the creatures in this poem to become comfortable with their human visitors, but there is also the need for the humans to quiet themselves. It's only after this essential first step that the speaker can begin to impose an order on her observations of the landscape, in this case the musical structure of a symphony. 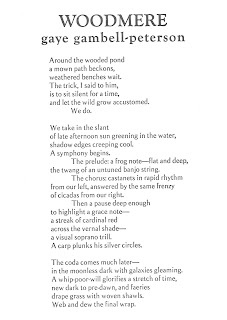 From random sounds, meaning is created; whether we sit by a wooded pond or on a bench downtown, it's what we do. The contrast of thin and thick strokes in Balham mimics the "there and gone again" elusiveness of the creatures and forces that create this poem's sounds. 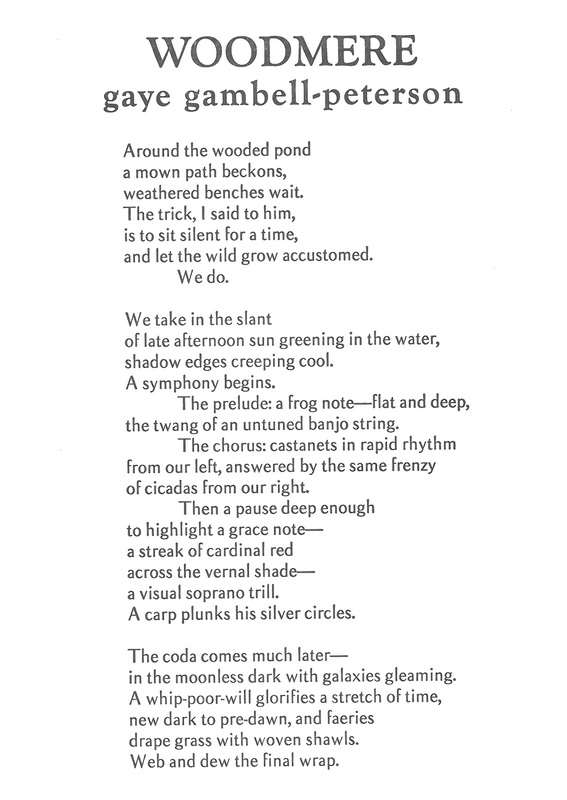 It also gives the page a lightness that matches the poem's tone. Goudy Old Style is weightier, but not so much as to capsize the balance of the page. Read the full text of the poem by clicking on the image or purchase it here. Willy is a very odd guy, but humorously so. It’s hard not to chuckle at his “conversation pit (filled with alligators and musty water)” or the cobra sitting in his chair, because they’re so over the top. Who keeps such creatures around the house? 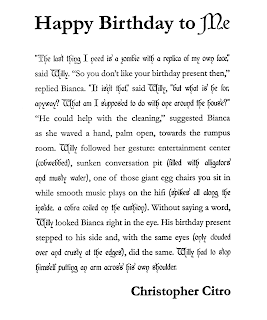 A guy like Willy, for whom a look-alike zombie turns out to be the perfect gift – and therein lies the heart of this poem: it's friendship. 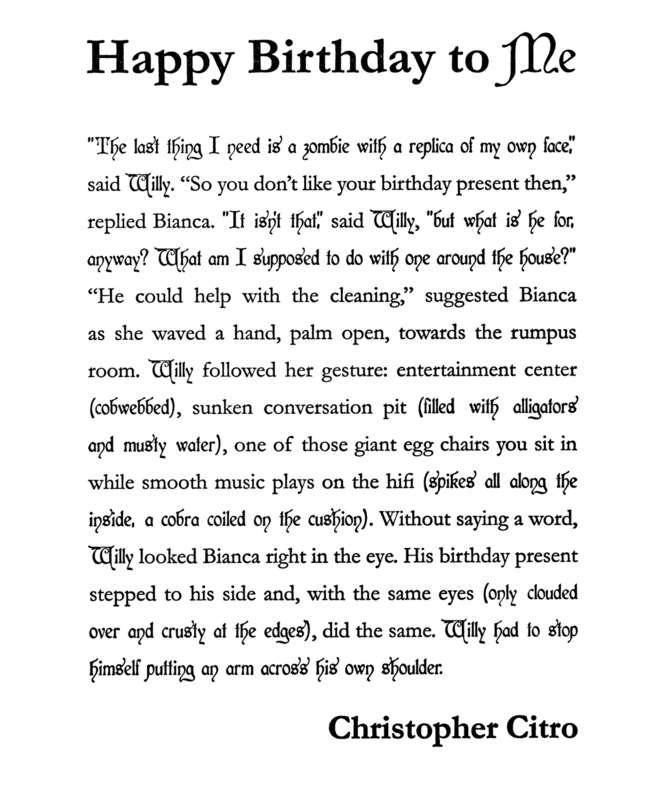 Bianca understands and accepts Willy as he is. She sees him more clearly than he (at least at first) sees himself and she responds accordingly. That’s a true friend.